How does what Sinek talks about relate to how to make change happen? We want you to be more free. To do this, we need to shrink government. The way to do this is to cut taxes and subsequently government programs. In order to do this, they’ve had to redefine “freedom” as solely consumer choice and less government. I completely disagree with their definition of freedom. But they are going about it the right way. We are going about it the wrong way. Let’s look at which policy will work best for health care. What about single payer? Ok, we can’t pass that. What about the public option? Ok, we can’t pass that either, let’s pass the Affordable Care Act and mandate that everyone have insurance. Why? Why are we doing this? Well, the previous thing we were doing wasn’t working. This, of course, is true. Unfortunately, the opposition was able to come up with and distribute a more compelling story about how Obama was taking away everyone’s “freedom”. Do you see now why health care reform might be unpopular? We lost on the ‘why’. Their narrative about ‘why’ was better marketed. 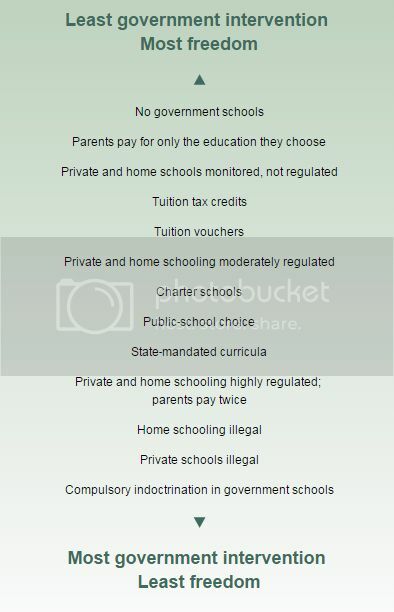 Here is how the Mackinac Center, a corporate think tank advances the privatization of education using the idea that freedom equals nothing more than smaller government. This is another way of saying: people don’t buy what you do, they buy why you do it. In other words, if we want policy change, we need to change what people believe first. This is why corporations have invested a lot of money in social change initiatives like business schools and talk radio and media. It is also why they want to eliminate public education. We often wonder why they’re so successful at getting policies they want enacted. Part of it is money. The other part though is that they understand how policy change works. They start with making their ideas “commonsense” (I put this in quotes because of course they won’t seem commonsense to you or I. We believe in different ideas. But we typically don’t start with these ideas. We start with the policies we want). Today we’re seeing the fruits (or rather the disastrous consequences) of this plan. Policy change looks so easy for corporate special interest groups and so difficult for people because these special interest groups have gotten so much public buy-in for terrible ideas like “smaller government = freedom.” Every policy is discussed within this small government/big government frame. The logic within this idea (or frame, as George Lakoff would call it) is that small government is always better. If people think the liberal case is “bigger government,” we will always lose. Ask most people in America how our country works and who it works for. Invariably, people will tell you that it doesn’t work for them. A great example is the #CRonybus legislation that Jamie Dimon from Citigroup lobbied for that puts our country on the hook for some $303 trillion in derivatives. I then ask them if this is about right. Most people agree. Then I lay out what democracy looks like. This isn’t rocket science. But it helps to have a conceptual picture so that people understand the ‘why’. The ‘why’ is that these things, both government and corporations, should benefit people. 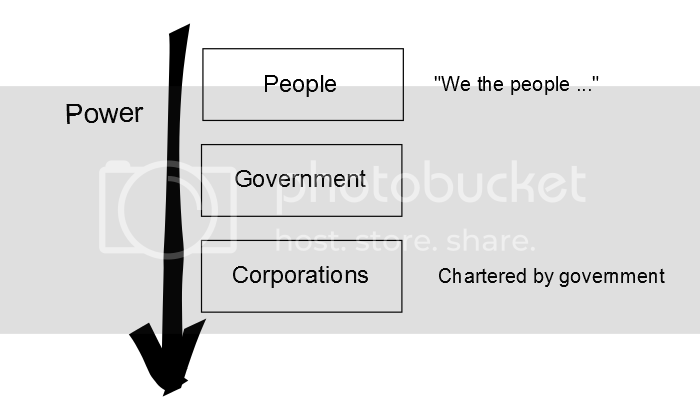 In this vision of how things work, the vision of our founders, corporations were only chartered for the public good. In other words, they were chartered to serve people. 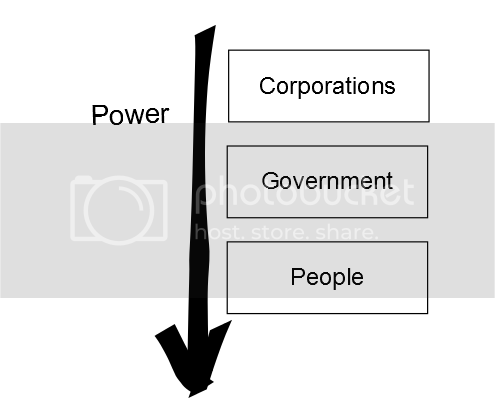 What makes sense within this frame is more democracy, less corporate rule. In other words, once you start getting people thinking within the idea that our government and our corporations should benefit people, it makes sense to move towards greater democracy. 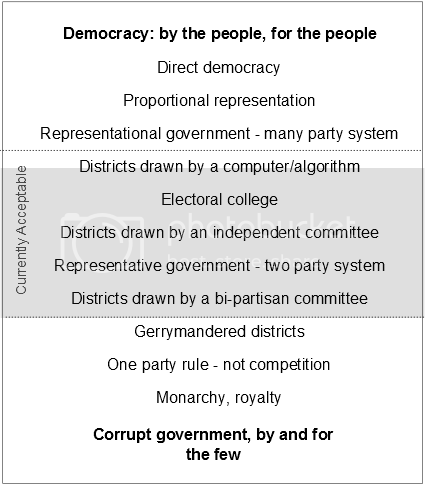 The democracy frame also makes the idea of smaller government look, well, silly. Making government smaller or even getting rid of government doesn’t change the fundamental problem. The problem is that things in our country are no longer working for people. Within a democracy, solutions need to satisfy the requirement that they benefit, you guessed it, people. The problem is that government is corrupt. It is owned by corporate special interest groups. Who really cares how big or small it is if it’s not working for people? The idea of democracy isn’t new. The problem is that corporate ideas like “small government” and “freedom™” have hundreds of millions of dollars of marketing muscle behind them. The U.S. Chamber of Commerce alone spends over $100 million a year on promoting and marketing their version of government (one that works for the U.S. Chamber of Commerce) simply so they can pass legislation that benefits them and it won’t be seen as corrupt. Corporate special interest groups have been teaching and promoting smaller government for 40 years because it makes all of the policy changes they want possible: privatization, cheaper labor, tax handouts for the wealthy, cutting earned benefits, money in politics, etc. They start with the why and then win on the what and the how. 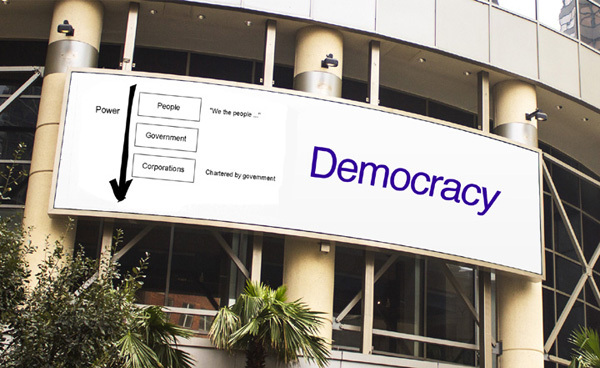 An educational marketing campaign for democracy. We have a better philosophy: democracy. The problem is that corporate special interest groups are winning the marketing battle with ideas like smaller government and “freedom”. 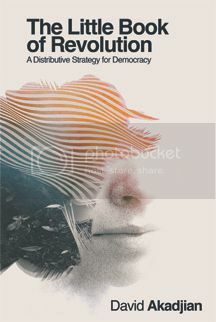 Reviving the big conceptual idea of democracy would help progressives win on just about every policy front: repealing Citizens United, getting money out of politics, the Fairness Doctrine, Voting Rights, public financing of elections, fair and non-partisan elections, public education, etc. We don’t need as much money as corporate special interest groups do because our ideas are better. But we do need to promote and help people understand these better ideas. And yeah, I’d find someone with better Photoshop skills to do the design. But you get the idea. We have to start with the better idea, democracy, and win on this idea in order to get better policies. Or, as Simon Sinek would say, we should start with the why and move outwards to the how and the what. If we had first won with a better story of democracy, health care reform wouldn’t have been so unpopular. Health care reform would have seemed like commonsense. Corporations have terrible ideas. But they’ve won because they invested in the infrastructure necessary to make their ideas “commonsense” to a large cross-section of America. We don’t have this infrastructure and when we do get access to media, we often don’t talk enough about ideas like democracy. We talk about policies. 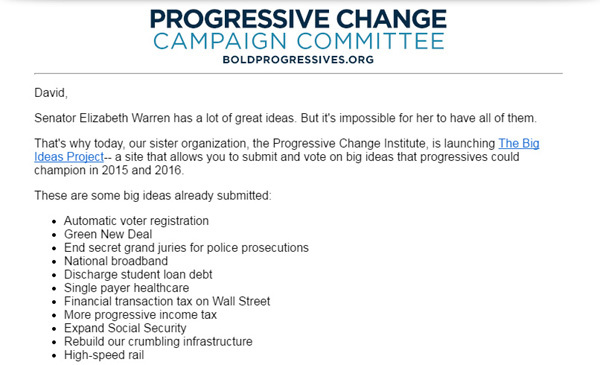 This is why I want to see a group like the Progressive Change Campaign Committee support an educational initiative for democracy. If we invested in educating people about democracy, we would win on countless policy fronts. If we won on ideas, policies would follow. Check out The Big Ideas Project and vote for your favorite idea. If you’d like to see more of these ideas win, consider voting for an educational campaign to help people understand democracy. Please also remember that this approach, starting with the why of democracy and not a policy, will help you win people over in your day-to-day conversations.